PABRADE, Lithuania — Artillery shells whizzed overhead as a group of American soldiers made their way through rugged terrain just 10 miles from neighboring Belarus. Some on foot and others in Humvees, the members of the 173rd Airborne Brigade Combat Team fired at targets and cleared bunkers and buildings during a live-fire exercise in Lithuania this week. They were not the only ones training in the region. On the other side of the border, Russia was conducting what some Western officials and experts say could be its largest military drills since the Cold War — a massing of troops that some claim numbered 100,000. "Everything we do is part of deterrence. Deterrence focused against any potential adversary to the United States or our allies," said Lt. Col. Hugh Jones, a squadron commander with the U.S. forces in Lithuania. Around 600 American paratroopers were training alongside their NATO allies as part of operation Bayonet Shield across the Baltic states. U.S. troops have upped their joint exercises with European counterparts in recent years as a show of force and to strengthen integration between their militaries. "The U.S. has a joint, persistent rotational presence of air, land, and sea forces in the region to support our allies to ensure Europe remains whole, free and at peace," Meghan Henderson, spokeswoman for U.S. European Command, told NBC News in an e-mail. "Conditions change, the world changes, you train for that as well"
She said Moscow's increased military activity meant the U.S. and its NATO allies have also had to raise their game, but "mathematically it is clear our forces are not sufficient to post an offensive threat to another state — unlike what we have seen in Russian exercises." Officially, fewer than 13,000 troops were involved in "Zapad 2017," Russia's sprawling exercise that spanned its western territory as well the Baltic Sea and its ally of Belarus before finishing Wednesday. However, NATO has criticized it for a lack of transparency. Russia has the right to exercise on its own territory and has invited some foreign observers, Henderson said, but added that the lack of openness "has worsened the European security environment and raised the risk of miscalculation." Some allies claim Russia is under-reporting by some distance the true size of the drills. "Even as we speak, around 100,000 Russian troops are engaged in offensive military exercise Zapad 2017 on the borders of the Baltic States, Poland and even in the Arctic," Lithuanian President Dalia Grybauskaitė told the United Nations General Assembly in New York on Wednesday. Few worry that the exercises are a prelude to a full-scale military assault, but some say they could act as a "Trojan horse," allowing Russian troops to stay behind in advanced positions now that the drills have finished. Russia's war with Georgia in 2008 and annexation of Crimea in 2014 both followed military exercises that allowed Moscow to move troops into key locations. The Baltic states feel Moscow's influence particularly acutely. Once part of the Soviet Union, Lithuania, Latvia and Estonia have significant populations of ethnic Russians. Many here fear that, like in Ukraine, Moscow may try to meddle in their affairs under the pretext of protecting this diaspora. While President Donald Trump has been criticized for offering lukewarm, mixed messages over his commitment to defending his smaller NATO allies, military officials have been far more clear in their attempts to show a united front. Regular training has allowed American troops to integrate with their European partners on a deeper level, according to Jones. He said his unit has been equipped to securely communicate via radio with allied forces. While the technology may have existed two years ago, it wasn't in place during the unit's deployment to the Baltics back then. "The longer we work with our allies, the more proficient we become," said Jones, whose squadron has operated in Hungary, Germany, Latvia, Lithuania and Estonia during the last three months. The unit’s current stint in the Baltics will culminate in a large live-fire demonstration alongside Polish tanks, Canadian artillery, and Spanish and British engineers in October. "Our level of interoperability has definitely increased," he said. 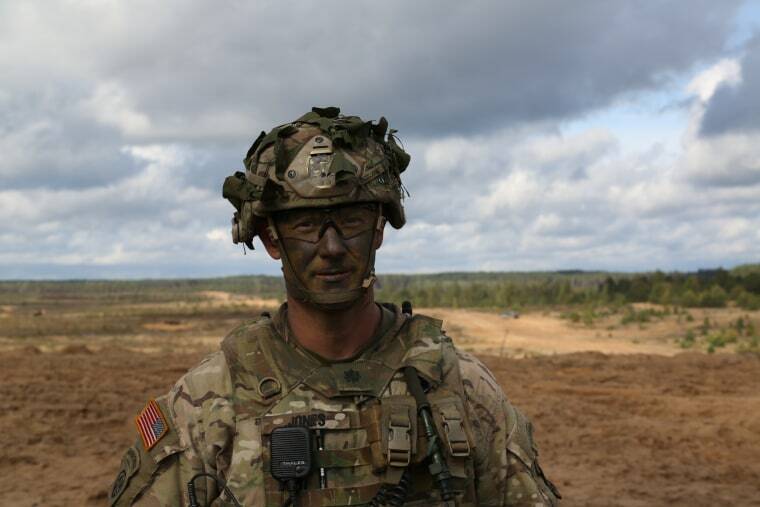 As well as tactical and technical cooperation, the training has allowed U.S. troops to build personal relationships with allies, according to Maj. Michael Herbek, who was commanding paratroopers of the 173rd Airborne Brigade in Latvia when NBC News visited Monday. "You don’t stop at one point," he said, "because conditions change, the world changes, you train for that as well." U.S. soldiers now have "years of experience in the Baltics," Herbek added. Carlo Angerer is a multimedia producer and reporter based in Mainz, Germany.